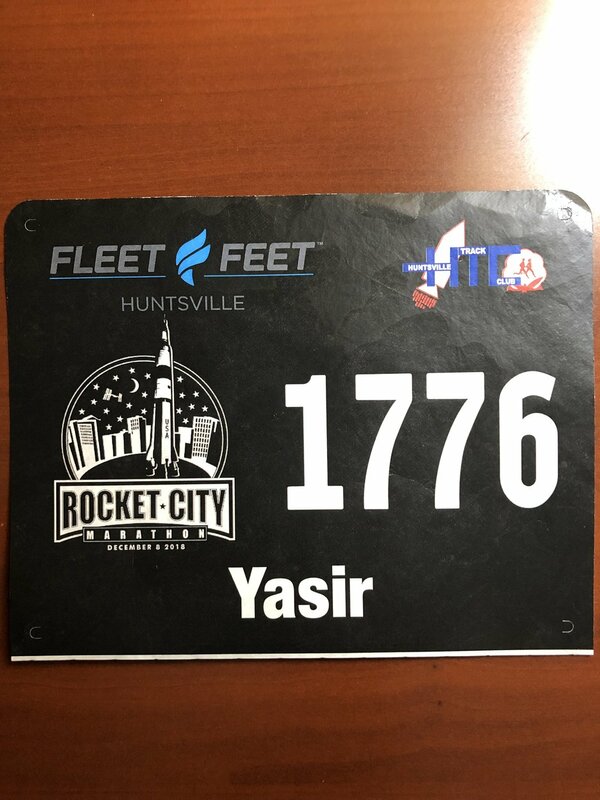 I flew into Myrtle Beach on Friday and picked up my bib. The expo was really well-organized and everyone was friendly. On race morning, I woke up early in Myrtle Beach, SC to run the Myrtle Beach marathon. I planned to meet up with my friend Vicki Dufner to run the whole race together. This was her 30th marathon in 365 days so she qualified for titanium level on Marathon Maniacs. I’m really proud of her. We started off with the pace group and dropped back little by little. It was slightly warm and got humid as the day went on. We walked here and there. There are parts of the course that are really scenic along the shoreline. I liked those parts of the course. It’s also fairly flat course. The medal is really nice and colorful. I did an interview with a Alan Blondin of Myrtle Beach Online. It’s a really nice piece. After the race, I said bye to Vicki and congratulated here and took off. I showered, changed, and went to the airport to go to Little Rock. I had to change planes in Atlanta, which had a fun walkway between terminals. I spoke with a Josh Snyder from the Arkansas Democrat Gazette about my participation in the Little Rock marathon. It was also a great piece. On race morning, I got up a little later than for Myrtle Beach because the race started at 8am. I drove to the convention center to meet Kit Fox of Runner’s World and his family who were running the half marathon. The marathon has this great little add-on you can purchase called Perks access, which gives you to morning food and drinks, private gear check, and a nice warm place to wait for the start. I met up with one of my Twitter connections, Mather Chaney, who happened to be pacing at around the pace I was looking for, 4:10. After hanging out with Kit and family for a bit, I headed to the start line to run with Mather’s pace group. It was a little cold and rainy, but not too bad. After a couple of miles, it started to hail! Small hail, but still hail. It was a fun experience. The course itself is pleasant and scenic with some rolling hills. This was my first time to Arkansas and I didn’t know what kind of course to expect. There were a few bigger hills around mile 14, 18, and 25. Some of the interesting sites along the way included a cheer station comprised of a huge group of cheerers on bikes, historic Central High School, the Capitol, great nature trails, and a pretty nice downtown Little Rock. One thing I find interesting about marathons in the south is that there are always several bystanders serving beer and donuts. I haven’t seen that anywhere else except in the south. I stick with water, sport drinks, nutrition packets, and fruit. I met a runner in the pace group named Eric from Michigan. He was pacing with our group and was running the half marathon. He was running the race as a prep for next month’s Boston marathon. 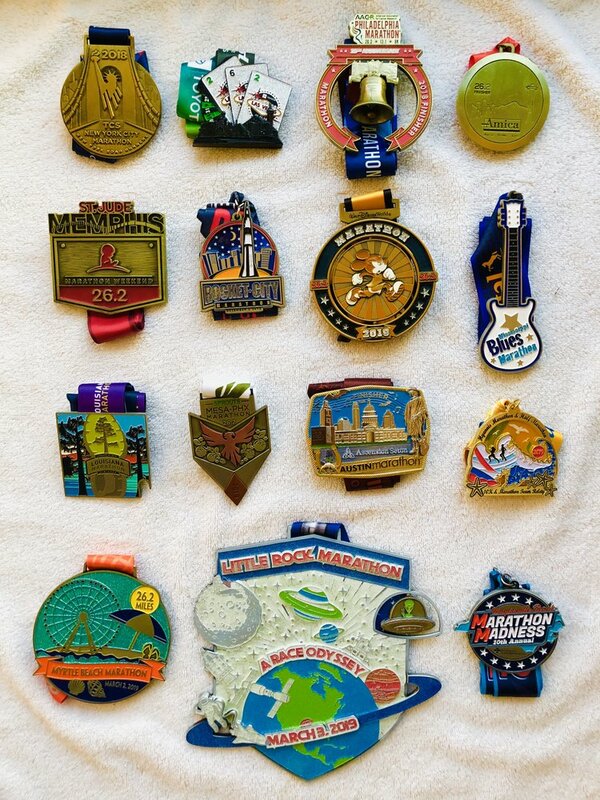 We spoke a lot about different marathons we’ve done and ones we look forward to doing. Mather and I got a chance to speak for a good chunk of time. I feel back around mile 18 when I needed a break. My legs felt a little worn out at that point. after a short break, I started up again. I took a few more short breaks here and there, and at mile 22 I continued running until the end, even at a much slower pace. 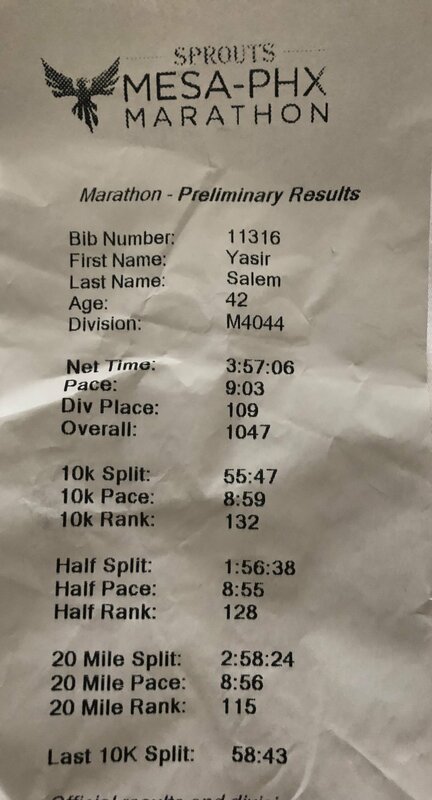 I ended up finishing in about 4:16. 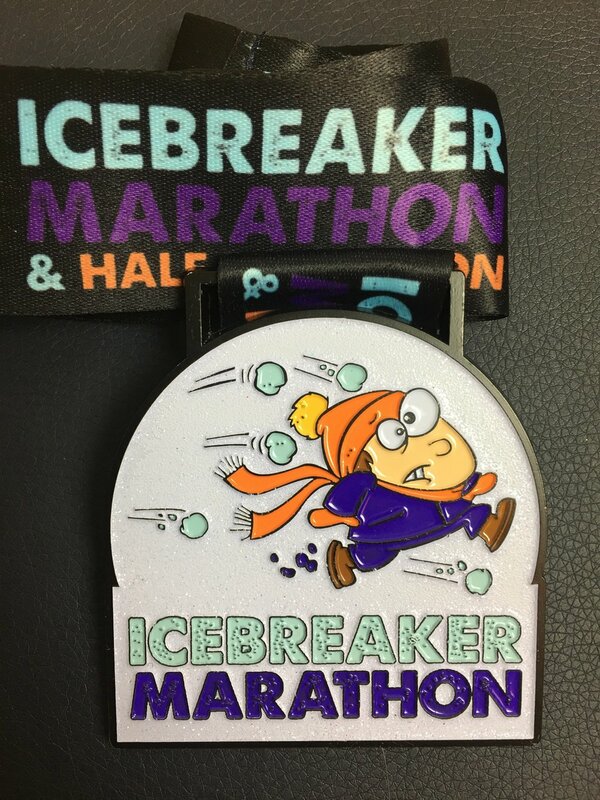 One important detail about this race is the HUGE medal they give out! After I finished I went to the Perks room to have warm food (pizza, tomato soup and pasta) and pick up my gear bag. I drove to my hotel to shower then headed to the airport to fly home. Overall it’s a great scenic course with warm, friendly fellow runners and spectators. The course is slightly challenging on some hills along the course. 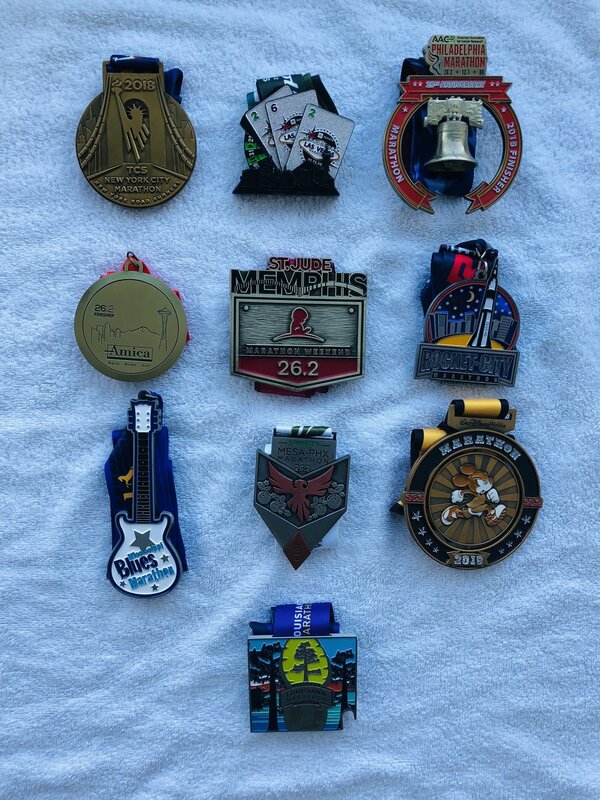 The finisher medals are a huge draw and the race directors do an amazing job pampering runners. I highly recommend this marathon for anyone. 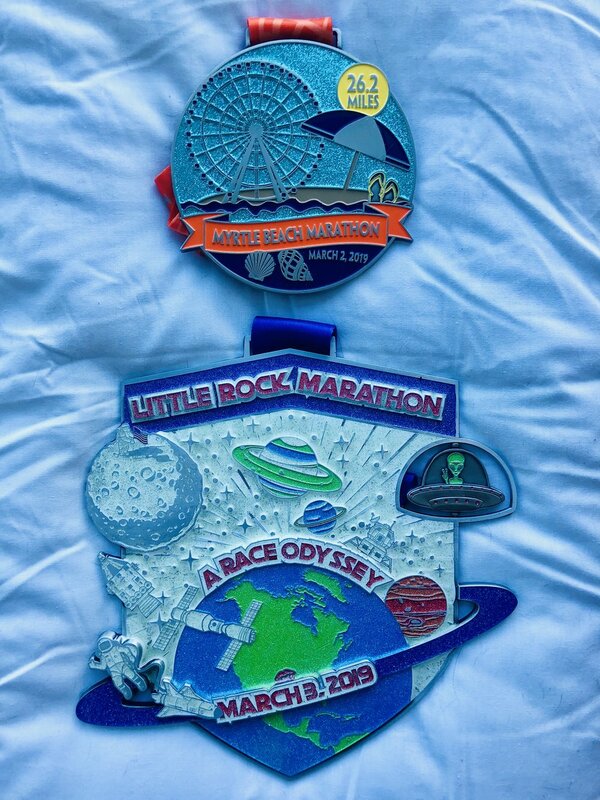 Once I got to the Little Rock airport, I was surprised that security asked me to take out my medal to scan even though I have TSA Pre and didn’t need me to take anything else out. The medal is that HUGE. Will finished his half in about 1:58. He went back to Sarah and Mike’s place to shower then met me back at the finish line to watch me finish. That was really nice of him. The medal is pretty cool, in the shape of a guitar. 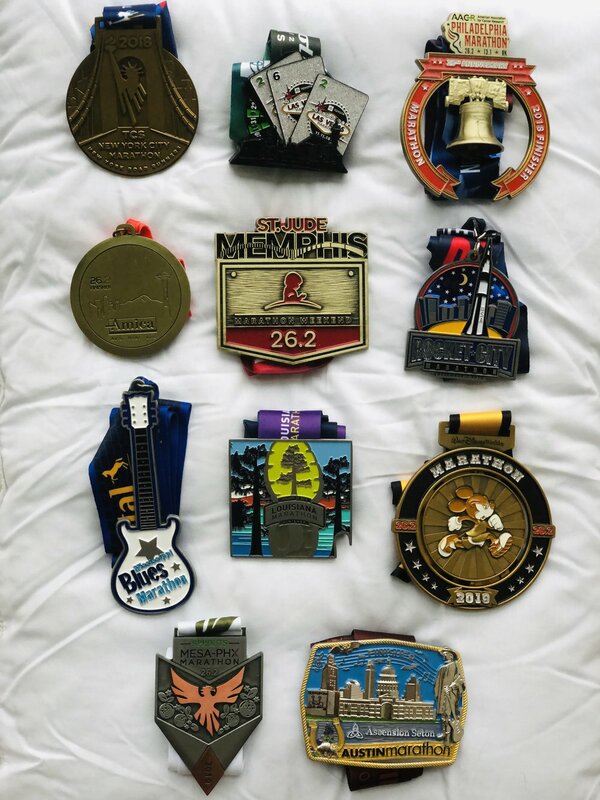 She’s ran another marathon in Alabama the next day. Overall, this was a good race. Looking forward to running Mesa-Phoenix Marathon tomorrow (#10!). I wasn’t prepared for the weather. I wasn’t expecting it to be as cold as it was. I didn’t have a long sleeve shirt or gloves. I kept my uniqlo jacket on for the first 3 miles. I decided to run 4:15 pace because of the conditions and because I still needed to ease back into my running schedule after a 5 week break during December and early January. It was a good decision to choose that pace. Baton Rouge is a relaxed place with nice architecture and nature trials. I love how I am getting to tour some of the most interesting cities of each state in the US on foot. I think it’s a great way to explore the country and people. Overall the Louisiana Marathon was a great race. Be prepared for a cold morning. They have several race distances, including the full, half and kids races. Des Linden competed at the half and won it. Overall I recommend this race as it’s a fairly fast and flat course, and has a tasty finisher festival! Check them out and sign up for next year’s race when they open up! Today I’m missing and remembering Gweneviere as I do every day. Today is a little harder because of the season. I feel a big void without her. 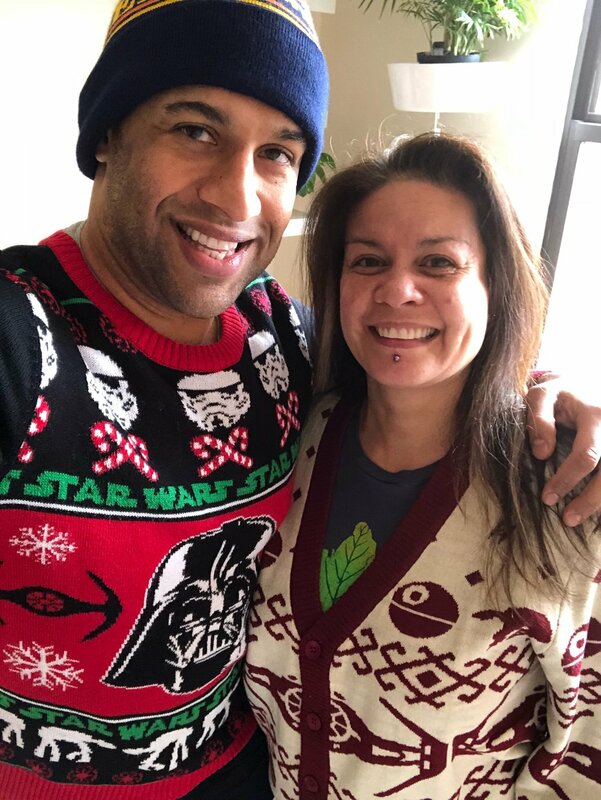 Last year (2017) Gweneviere and I spent Christmas Eve by seeing the new Star Wars at the IMAX in Manhattan. We loved seeing movies at what she called our ‘lay down theaters’ with cushy, reclining seats. We used to bring throw blankets, take off our shoes and change into comfy socks and hold hands throughout the movie (unless we were digging into popcorn or drinking seltzer). I miss her. The Gweneviere Mann Foundation thanks you all for all of your continued support. Wishing you and yours a wonderful holiday season. We’ll see you in the New Year! Marathon 4 of the #50in50 was the Seattle Marathon. 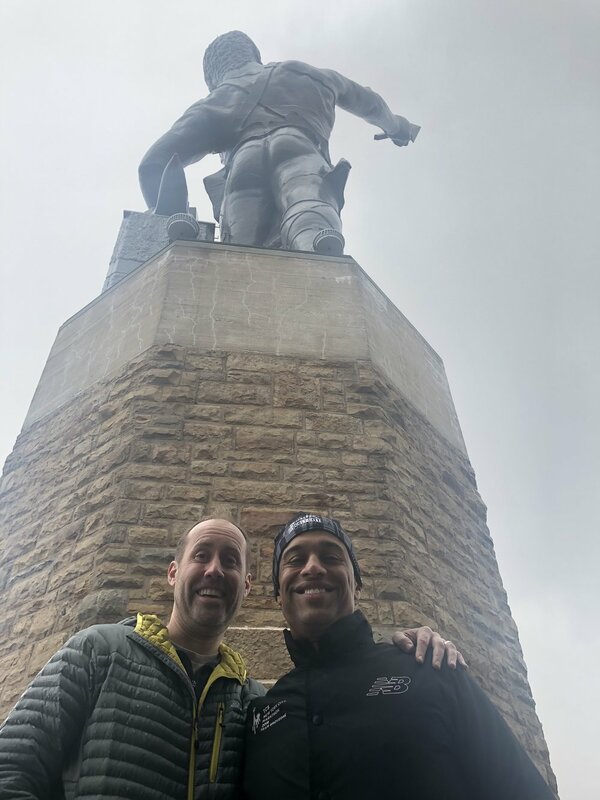 I randomly saw my Instagram friend Warren (@kingpiggy), a fellow triathlete and runner from NYC, at the start line and ended up running the whole race with him. I knew he would be at the race, but I hadn’t asked him if he wanted to do the race together. Warren’s brother is Wayne Algenio, a YouTube personality. Warren had just finished an Ironman 2 weeks earlier and was in Seattle for the Thanksgiving weekend, and he signed up for the marathon on a whim. His PR was Philadelphia Marathon in 2016 4:09:30. So I suggested we run with the 4:10 pace group. He had never run with pace group, but he was open to doing it. It saved us a ton of effort. We finished together at 4:07 and he PRed. Memphis is a nice town. The people are super friendly. I arrived into town on Friday night and quickly ran over to the Expo to pick up my bib before they closed down. The race was the following day on Saturday. Because of rain in the forecast they pushed the start back by 1 hour. I was staying in a hotel right next to the starting line so it was very convenient. The weather was relatively hot for running and humid (65 degrees and 90%). I took it daily easy on the run. During the run I met a very interesting character named Vicki who loved the donuts a family along the route was giving out. Turns out Vicki is a recent widow as well and she’s running 30 marathons in 30 states and she had just run Seattle as I did. It was surreal to meet her of all people. We ran about 14 miles together until the finish line. I’ll see her again at several other marathons next year. Great marathon, great cause and a really huge medal. And I got to meet Elvis! I saw several Elvis impersonators in Las Vegas’s Rock n Roll marathon. Another medal to add to the series!